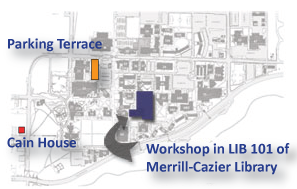 To find LIB 154 , walk through the main entrance to the library, and walk back toward the stairs and restrooms. The class room is to the left of the restrooms. See here for an interactive campus map. . Note: All slides copyrighted by presenters unless otherwise noted.